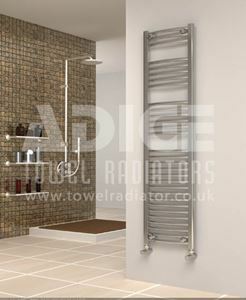 300mm Wide and 1500mm High Anthracite towel radiator with 427 Watt - 1458 BTU/h @ Delta 50. 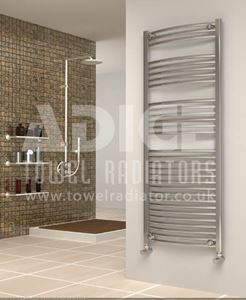 300mm wide and 1500mm high chrome flat heated towel rail with 338 Watt - 1152 BTU/h @ Delta 50. 300mm wide and 1500mm high white flat heated towel rail with 427 Watt - 1458 BTU/h @ Delta 50. 400mm wide and 1500mm high chrome curved heated towel rail with 425 Watt - 1451 BTU/h @ Delta 50. 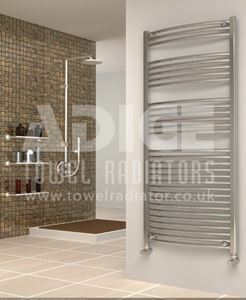 400mm wide and 1500mm high chrome flat heated towel rail with 422 Watt - 1440 BTU/h @ Delta 50. 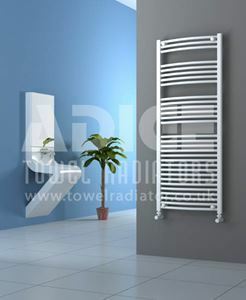 400mm wide and 1500mm high white curved heated towel rail with 538 Watt - 1837 BTU/h @ Delta 50. 400mm wide and 1500mm high white flat heated towel rail with 534 Watt - 1823 BTU/h @ Delta 50. 600mm wide and 1500mm high anthracite towel radiator with 748 Watt - 2551 BTU/h @ Delta 50. 600mm wide and 1500mm high chrome curved heated towel rail with 594 Watt - 2027 BTU/h @ Delta 50. 600mm wide and 1500mm high chrome flat heated towel rail with 591 Watt - 2015 BTU/h @ Delta 50. 600mm wide and 1500mm high white curved heated towel rail with 752 Watt - 2566 BTU/h @ Delta 50. 600mm wide and 1500mm high white flat heated towel rail with 748 Watt - 2551 BTU/h @ Delta 50.